I’ve tried a number of healthy dessert recipes in my day, and they always manage to taste, well, healthy. Not quite like the real deal, rather an acquired taste that approximates the taste of the original. NOT THIS RECIPE. This cheesecake tastes creamy and decadent. The strawberry sauce on top really completes the taste for me, but I’ve tried it with a number of different fruits purées [blueberries, peaches, and mangoes] when I’ve run out of frozen strawberries. I have Angeline of “The Epicurean Bodybuilder” blog to thank for introducing me to this recipe. She did a Caramel Macchiato version of this delicious cheesecake, and from there I found the original recipe. The nutrition facts provided are for a plain slice of cheesecake. *The Percent Daily Values are based on a 2,000 calorie diet. The values are calculated from values provided in the USDA food database. Preheat Oven to 325°F. Prepare a 6″ cake pan by spraying with non-stick spray and lining bottom of pan with parchment paper. Whip cream cheese with mixer on medium setting. Scrape sides of the bowl to ensure full mixing. Add Splenda. Mix on medium until all lumps are removed. Scrape sides of the bowl. Add eggs. Mix on medium until fully blended. Add remaining ingredients. Mix on medium until fully blended, approximately 3 minutes. Be careful to start the mixer at a low speed so the protein powder doesn’t become airborne; you want it in your cheesecake and not all over your kitchen! Pour batter into greased pan. Flatten and even out surface with bottom of spoon. Turn oven to 200°F and bake for 55 minutes. Remove pan and let cool on the counter for an hour. 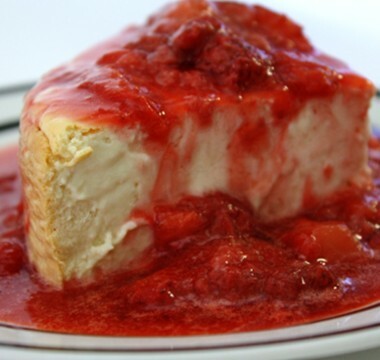 Carefully flip cheesecake out onto storage dish, cover, and refrigerate overnight. From my experience, if you attempt to remove the cheesecake from the pan too soon, it may fall apart, but if you let it cool too much it will be impossible to remove. Alternatively, you can use a springform pan, rather than a cake pan.